I decided to create another card for my birthday box! I started by gathering up all my supplies. for my next layer. I left them to dry naturally. and Picket Fence to give a 'Spring Green' colour. Once dry, the edges were distressed. the stems and applied it much thicker on the flower parts. Collage Medium there made it so easy to apply the crayons. I hope you can see the subtle crackles in this photo. Twisted Citron. I scrunched it up, whilst drying it with my heat tool. Stains and Crayons work beautifully together. with the contents of the travel bag! will find time to join in the fun. Love the green and the textures, gorgeous card! So beautiful Anne. 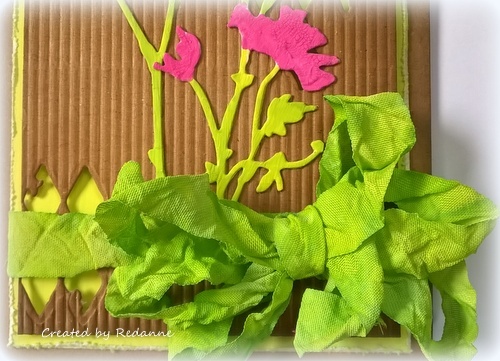 The fresh colours and the textures make this a super creation and a card that anyone would love to receive. Love, love, love the super bright colours! Gorgeous flowers and the die cutting with the thinlets looks so cool with the background showing through. The ribbon is fabulous and it all looks brilliant on the Kraft card! Oh wow Anne, Spring s certainly well in evidence in this fantastic card, what a fun and funky creation! Beautifully put together love it!! Glad to see someone else makes cards for a box of future needs. We are still waiting for spring here in NE Wisconsin. Our weather can't make up its mind if is winter or spring as we bounce between snow, rain and ice. You green and pink give me some hope that spring may actually arrive sometime soon. thanks as always for sharing. A Wonderful card! Anne that really lifts the spirit with those bright n cheerful colours. They look fab against the kraft and corrugated card . 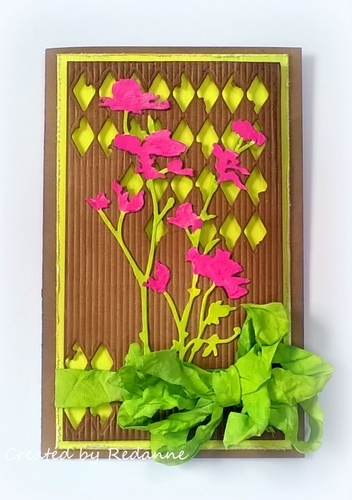 Loving the crazing on your hot pink wildfowers and how the lush spring green shows through the die cut corrugated card- clever idea. Such a great way to use the contents of the travel bag . Anne...your card is so pretty and your tutorial is really good! Thanks so much for sharing your steps in creating this lovely card. I love that floral die cut. You've really done such a beautiful job of crazing and coloring it with such bright colors. LOVE the colored ribbon to match! Love the corrugated kraft background with the die cut harlequin design. Such a fun card Anne and I adore your ribbon. This is absolutely gorgeous, Anne!! I love the colors!! The details and design are so fabulous!! How do you come up with all of these ideas anyway - don't know a thing about the Crazing Collage Medium. I think you must own every TH product out there! Beautifully made Anne! What a fabulous shot of springtime colour to wake us up! Gorgeous vivid colours and lovely subtle crackle. Stunning! I love those wild flowers - have that die ordered but they are taking so long to get to me I don't think I will order from this site again. Our spring has been rather grey - not any rain really but grey. We are supposed to have thunder storms and rain tonight. As I said - looking forward to pictures and a make or two from your very exciting weekend! This is how old my brain is getting - I had previously commented on the post - oh woe is me! Wonderful spring card with lots of gorgeous details! Great use of those products! This is gorgeous, thank for sharing.